viewfromaloft - First Day of Kaprow's "Fluids"
First Day of Kaprow's "Fluids"
Above: Close inspections of "FLUIDS" at the The Geffen Contemporary at MOCA Inset: After the last ice block is placed at CSULA; a victory dance in the parking lot. California State University, Los Angeles parking lot and the courtyard for The Geffen Contemporary at MOCA were two sites for a re-creation of Allan Kaprow's 1967 communal labor and art installation project “Fluids.” From Friday to Sunday, volunteers around Southern California build structures made of 50-pound blocks of ice, and it survives unsteady foundations or ice mortar chipped by novice igloo builders, the large assembled frozen roofless brick houses (measuring 30 feet long, 10 wide and 8 high) are completed, then allowed to melt in the sun. 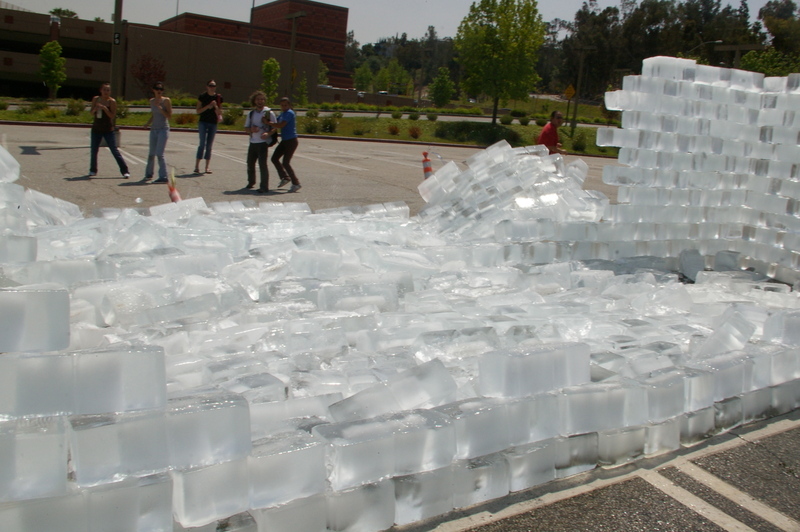 While MOCA’s was secure to melt on its own, the CSULA structure collapsed after 17 minutes of being completed. 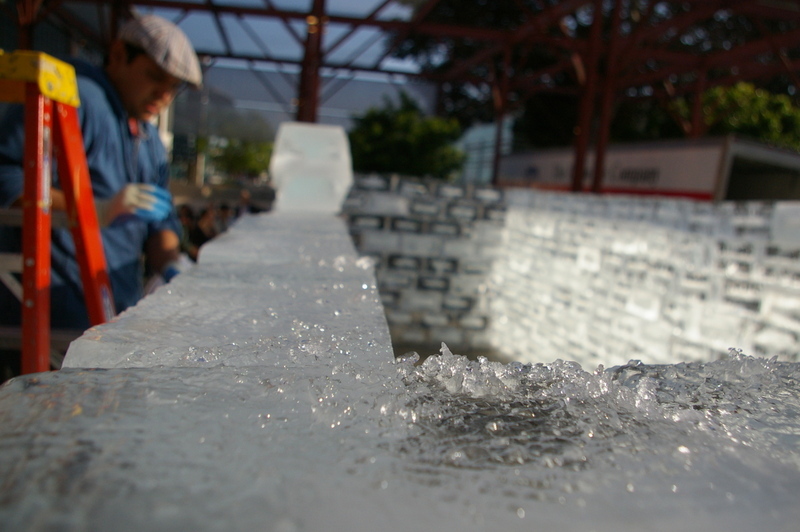 A difference may have been technique; crew CSULA laid their blocks of ice flat, rather than sideways, and were forced to scrape it thoroughly to make smooth and level for assembly. 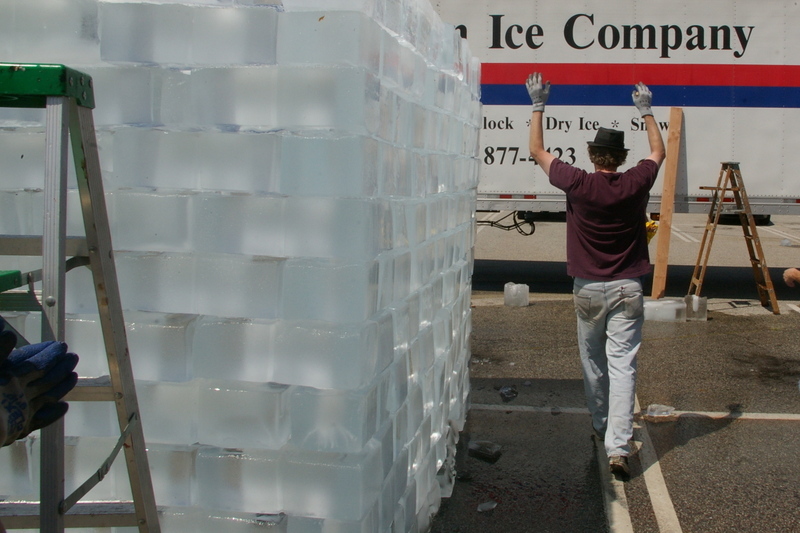 MOCA’s crew placed the ice on its side, the smoothness then scraped slightly for ice grip, making assembly quicker and cleaner. The mid-afternoon sun meltdown at CSULA and the late afternoon triumph at The Geffen were both considered successful interpretations of Kaprow's "Happening"
FLUIDS continued over the weekend in various locations, including "A Place Called Home" in South LA, "Two Rodeo" in Beverly Hills on Saturday, and McArthur Park Sunday morning. 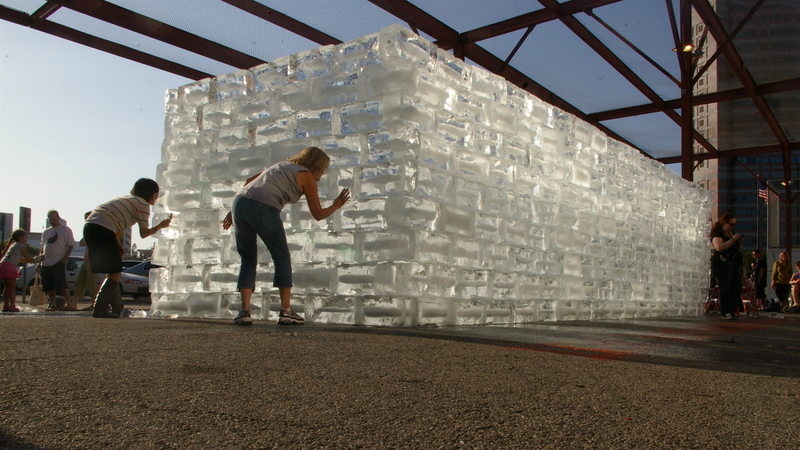 "Allan Kaprow-Art as Life" continues at the Geffen until June 30. Water conservation means nothing to these people...boycott ice art. It's recreated every 41 years. The earth can handle it.